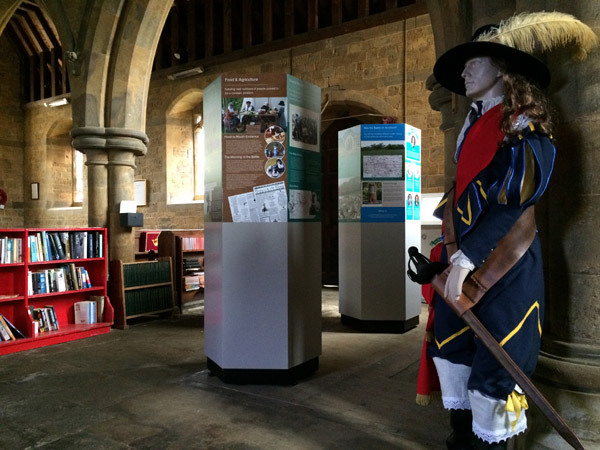 A free and interactive visitor exhibition adjacent to the Battle of Edgehill battlefield and permanently installed within the beautiful surroundings of St Peter's Church in the village of Radway (Warwickshire, England). The exhibition is a modern and permanent visitor hub for one of England's most historic battlefields. 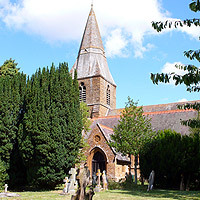 The village of Radway sits within the battlefield and the exhibition is installed within Radway's St Peter's Church. Information boards, artefacts, specially commissioned films and interactive displays explain the events of the momentous battle and relate the impact it had upon the ordinary people of Radway and the surrounding area. The exhibition forms the perfect base from which to explore the battlefield, the surrounding landscape and this historic village. Here on Sunday 23rd October 1642 the royalist army of King Charles I engaged the parliamentarian army in the first pitched battle of the English Civil War. Approximately 25,000 men clashed that day and the news would reach all corners of the country. Mass grave pits were dug and legends were born, but archaeology from the battlefield would not reveal many of the battle's secrets until only recently, in the 21st century. The Edgehill battlefield remains the largest in Britain and the battle was technically the longest of the entire conflict as military manoeuvres lasted a further two days. 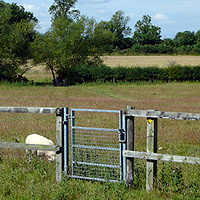 Public footpaths form part of the Battlefields Trust battlefield trail across the battlefield. Our exhibition is free - but donations are gratefully accepted - and is open during daylight hours virtually every day of the year. Anyone interested in the battle is very welcome to visit the exhibition - it is suitable for all ages, families, organised groups and school parties. We provide newly purpose built toilet facilities and from the exhibition you can walk the battlefield, explore the historic village and enjoy the public footpaths up and across the Edgehill escarpment. 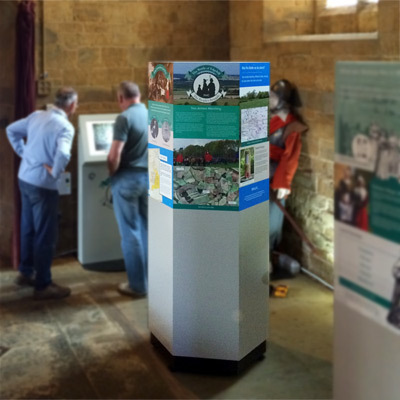 We have also installed two duplicate 'wind-up' audio visitor's guides within the village to enhance your visit. 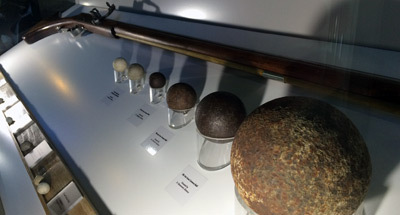 The Radway Battle of Edgehill exhibition allows visitors to explore what happened at the battle, who was involved and why, what weapons were used, what the battlefield has revealed and how the local population experienced this momentous event. The exhibition also asks Was the battle an accident ?, Villains or Heroes ? and What was Radway like in 1642 ? Artefacts are clearly displayed in illuminated cases and upon the walls, while life-size manikins demonstrate the style of clothing soldiers and the local villagers wore. The exhibition features an interactive touch screen display allowing you to view modern and historic scenes of the battlefield, army deployment plans, archaeological surveys and specially commissioned videos exploring the impact upon the lives of those that witnessed the battle, those that fought within it and a film exploring the battle itself and how the battlefield is today. For years, visitors to the battlefield have had precious little to help with their interpretation of this historic place. The exhibition provides a visitor hub and focus for the start or end of your visit to one of Britain's most historic and enigmatic of battlefields. Many congratulations on an outstanding exhibition. Very informative. Interesting exhibition, especially the effect on local people. Excellent. An even telling of the battle from both sides. What a well presented and interesting display. Fascinating exhibition - particularly liked the artefacts and the interactive display. A very good exhibition to help our grandchildren understand the Battle of Edgehill. Outstanding. A truly first rate way to process and experience this epic battle - Thanks. A beautiful and classic English village surrounded by a plethora of well signposted public footpaths which you can enjoy at your leisure. The village enjoys its own impressive history, including the architecture and hillside landscaping of the world renowned Sanderson Miller who lived at Radway Grange - in the heart of the village - for much of his life during the 18th century. 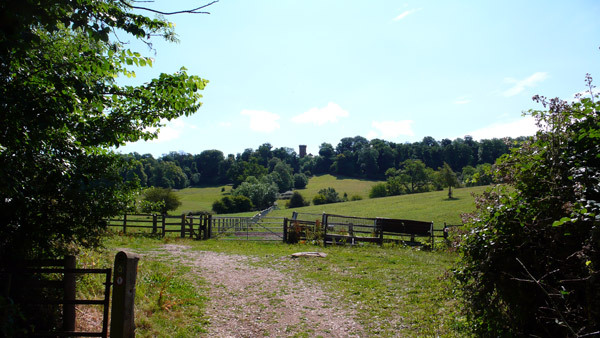 Visit the historic site of the earlier medieval church, the ancient cart wash, the Fiennes Miller Obelisk and the Radway Meadows nature reserve, as well as enjoying walks through Miller's landscaping above the village (including his beautiful wooded trails through the escarpment's shady woodland canopy). Overlooking Radway is Miller's famous castellated Radway Tower (now a restaurant and Public House) along with an ancient track way dating back to the middle ages. To help enjoy your visit we have installed two duplicate wind-up audio guides (left) for you to use within the village. 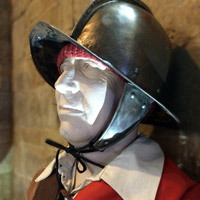 The battle exhibition is permanently installed within the beautiful St Peter's Church which is a fine example of gothic revival and is where you can also view the famous effigy of Captain Kingsmill; killed at the Battle of Edgehill. Battlefield & Radway visitor map (PDF) showing public rights of way. A list of suggested walks is shown below. Radway Grange was once owned by Walter Light, whose daughter married Robert Washington in 1564. They were the great-great-great grandparents of George Washington, the first President of the USA. More recently, Earl Haig, Commander-in-Chief of the British Forces during World War One, lived at the grange for a time. (Motion sensored lighting lights up the exhibition. *If the door locks, there is a large button near the door to let you out). The church remains a fully functioning place of worship and traditional ceremonies and religious services continue. (The church - and exhibition units - benefit from modern CCTV security, triggered security locking systems and remote alarm systems). Parking is easily available outside the church (please park sensibly and considerately). Modern toilet facilities are available in a separate building behind the church. (Follow the path). A small selection of shops, pubs and a coffee shop are available within nearby Kineton, while the "Castle at Edgehill" [Radway Tower] - on the hill in Edge Hill village - provide an excellent public bar, beer garden, restaurant and tea & coffees. School parties: Please advise us of your visit as we can provide children's tables and chairs - available for your use - which we keep in storage, at the church. History group visits: We can provide light catering and refreshments at the village hall for group visits when required (with advanced notice). Bespoke programmes for schools and other groups can be arranged. For just £5 per head you can have your own personal guide to the exhibition and a one hour history walk around the village of Radway. If you are interested in booking a tour, please let us know by sending us your contact details - using the email address towards the bottom of this page - and we'll contact you to discuss the arrangements. Thank you. View St Peter's location with Google maps. 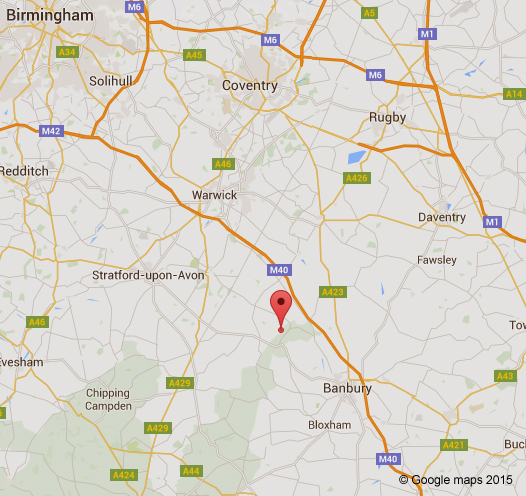 Certified Caravan Campsite at Whitehouse farm (listed here). www.battleofedgehill.org/edgehillwalk: A simple Radway & Edgehill walk using Google Maps, with points of interest along the way. Distance: 2.50km. Open and use when in Radway; starting from Saint Peter's Church. Tested satisfactorily using the O2 network. The link will work in your web browser or will open directly in Google Maps (if you have it installed on your device). Tip: If you experience problems - leave the Google Maps app open - and simply "re-click" the link above (which reloads and refreshes the map). Initially you may need to click the link twice. View the public footpaths around Radway using free Bing online mapping: print before your visit as the footpaths are not available on mobile devices. The simplest walk is to follow the clear yellow arrows and paths, starting near the village pond* and leading directly uphill towards the hilltop Radway Tower. Enter the hilltop woods, past the stone bench, and bear left to continue following the main route. (Hereabouts you can take an obvious detour up to the Castle Inn [tower]). The woodland trail leads through the woods with Radway down on your left. Eventually you'll reach a clearly marked public path on your left (also accompanied by another stone bench), leading you directly back down to the village through a large grass pasture. * Radway Pool/Pond: is left (out of the Church gates main entrance) and then right down 'Westend' (lane) to the far end. Please do not 'hotlink' directly to these files. If you do not have MS Word or MS PowerPoint on your device/machine, you can view these files using the free MS viewers: Word viewer, Powerpoint viewer. If you do not have acrobat reader to open PDF files you can download it for free: Acrobat reader. Send us a tweet about your visit! A collection of images to inspire your visit! 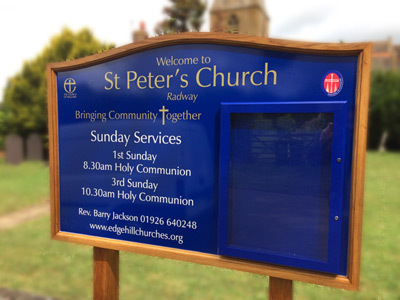 You can contact the Radway Saint Peters church warden via our Parish Churchs website. responsible for the content of external websites which this website links to.